First Impression: I love spirals and all the animals looks so beautiful here! This card really showcases the great cylce of life and diversity. Description: A great spiral of the earth's animal life is shown here with the colors of the rainbow. Colors: Soft Browns, Red, Orange, Yellow, Green, Blues, Purple, White, and Black. Senses: A great peace and awe within. Symbols: Spiral, Animals, Rainbow, Life, Creation, Evolution. Story [Intuitive]: The Great Goddess sleeps in the cosmos in the darkness. As she lays among the stars she dreams and from her thoughts life is born. All the animals come from her heart as she sculpts many creatures and breaths upon them the breath of life. She is contented in her work, and often embodies these creatures to soar the open skies, dive deep into the ocean, or explore the evergreen forests. When it is time for the cycle to end she takes them back into her center, each soul, each memory, each experience. Holding them to her breast and being so grateful to have their company and their stories. She rocks the great ark of the universe, singing to it the stories of creation and rebirth. Loving them as only a mother can, with a whole unconditional heart. 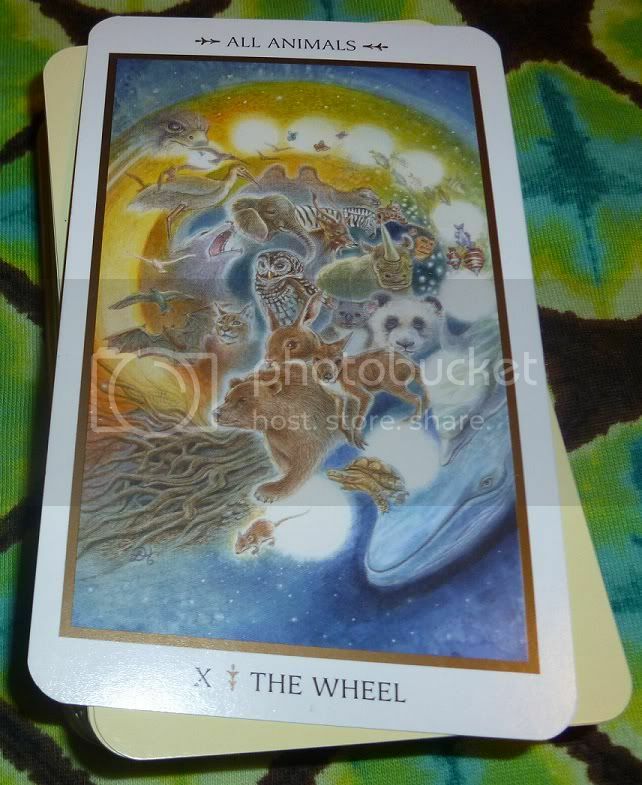 My Experience with The Wheel: The wheel of life is turning all around us. We see it in the seasons, we feel it in our bodies, we see life and death everyday. Cultural Reference: Creation stories exist throughout all cultures. Numerology Reference: (1+0=1) 1 - Leader, Independent, Original, Determined, Self Assured, Creative, Ambitious. Possible Meanings: Tapping into the source of love, Evolving your understanding of nature, Being aware of the cycles within your life, accepting and loving diversity in your life, watching your creations grow/evolve. Reversed: Feeling cut off from the source, not seeing progress, feeling separate from nature, not accepting or being aware of cycles and patterns, having issues with diversity, not being able to see the whole picture. First Impression: Love, love, love, love this card! One of the best Wheel cards I have seen! Symbols*: The wheel is turning, symbolic of change: the cyclic nature of life, the passage of time, and transformation. Nothing remains stagnant but is based on impermanence and continuation. The animals are rotating together in a confluence of elements. The fire element is represented by the warm colors. Its active nature sets all life into motion. Out of air rise the birds and butterflies, symbols of transcendence. Water represents the unconscious and is the container of our emotional qualities. From the water flow all manner of aquatic creatures. The earth element is grounded in warm brown and green hues, indicative of the earth’s fertile nature. Life returns to earth only to be born again into the “great eternal round”. The illuminated orbs remind us that, like the phases of the moon, life is cyclical. Changes are inevitable and an integral part of our collective existence. Description*: The animals can be our guides and teachers. By taking the time to observe the ingenious ways nature balances itself, we can become more active participants in the rhythm of life. It is important to be aware of our external environments as well as our internal beings. The animals can send us messages in a variety of ways; they can appear in our dream states as spirit guides. They may have something to tell us. They have the potential to stir the imagination and evoke imagery that may not be perceptible on a conscious level. They personify the elements and enable us to see more clearly, from the profane to the sacred. They have the ability to communicate messages that defy time. If one observes animals, one will notice how much they live in the moment. The Wheel showcases all manner of creatures. The snake’s ability to shed its skin and to be reborn is analogous to the cycle of life. The birds serve as mediators between the different planes of consciousness. The butterflies symbolize transformation; the lynx is clever and possesses excellent eyesight; and monkeys are playful and mischievous, but also sacred. Owls epitomize wisdom. Their reputation as wise has been assimilated into popular culture. The bat represents immortality. Bats have the ability to discern things in the dark with their keen senses. The rhino’s roundness represents fecundity; fish are born from the depths of the water, as represented by the psyche. The dolphins are psychopomps, assisting souls and spirits to the otherworld. Whales are among the biggest animals on earth. Their majestic, deliberate movements are subtle and powerful. A small creature, the mouse can evoke wonder with its quick and efficient movements. The elephant is wise, the turtle has endurance and the ability to carry its heavy burden, and the wolf represents internal energies and the dark forces of the psyche. Possible Meanings: We can live richer lives if we pay attention to whatever animals have to teach us. The resilient nature of the animal spirit can help us to accept life’s constant changes and to learn how to adapt and go with the flow. Senses: I can just see all the animals flashing by in front of my eyes. All are looking at me, smiling. Patiently, I stand still, watching these animals pass me by. It is time for my next phase. I can’t wait to see which animal stops in front of me, guiding me to my next stage. Thoughts/Points to Ponder: I love the aspect of the starry night sky still being present. This card is a very vibrant, colorful card.